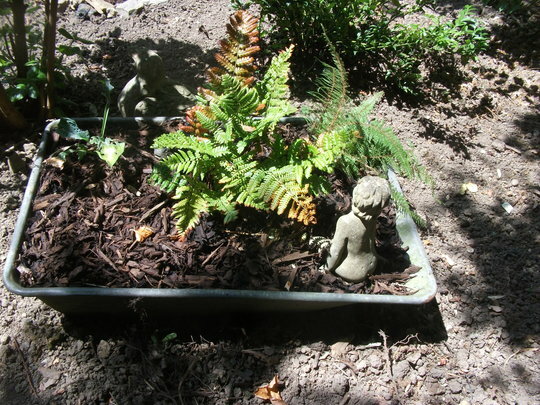 The frame rusted off my wheelbarrow so as I had a Bressingham Blue Hosta and Polystichum polyblepharum (Japanese tassel fern) that needed help I thought I would make the barrow into a bog garden in a shady area of the garden. 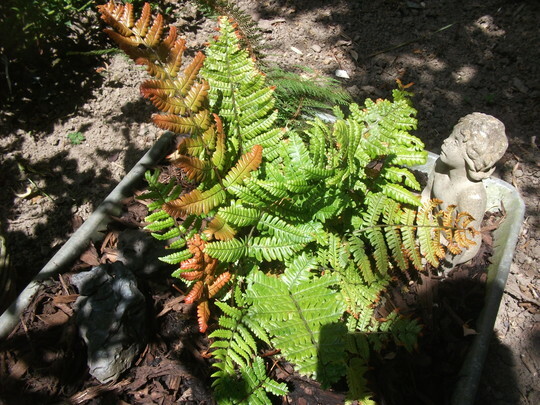 I have added a new fern in the centre and hope the 3 plants will cohabit happily. That's a lovey idea I am sure it will mature nicely. That will look good - though the little critic sitting in the corner seems to be a bit dubious! I thought Polysticum liked well drained soil though? It looks lovely nice touch with the little girl she s lovely. Added to GoY pedia feature ideas. ... I've added to GoYpedia. Sadly, 'Bog Garden Plants' is not one of my GoYpedia pages ... otherwise I would have added it there too ... your design is such a nice project that could be done by people with small gardens and by newcomers to gardening. So I've now added it to Small Gardens also. I love this. The only problem is when I see a good idea like this I want to "recycle" it for my own space. If I keep doing that Ill end up with no space at all. Great year for roses but where are the green and black fly?